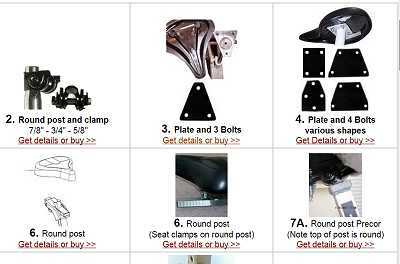 Which exercise bike seat adapter do I need? 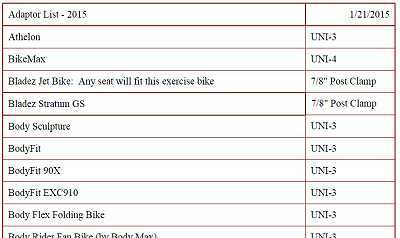 If your Exercise Bike is not listed here, We'll double check or make you a custom adaptor, just email or call. As you can see, the Lifecycle c9i (formerly the 5500HR) tops the chart with seven nods, and the Tunturi F520 follows with four. The Schwinn 105p and 205p (upright and recumbent versions of the same model) round out Fast Answers. The Vision Fitness R2000 received two votes, but we did not include it in Fast Answers. It has nearly identical features to the Tunturi F520, which lists for $140 less. In one side-by-side review of the two bikes, the Tunturi won out with a more comfortable seat, and easier on/off. We'll make you a custom adaptor for your Exercise bike. Ready to purchase the adaptor kit?